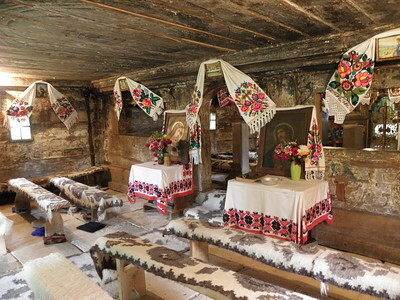 The Wooden Churches of Maramures are a selection of eight examples of traditional wooden architecture. They were (re)built in the 18th and 19th centuries, after the last great Tatar invasions ended in 1717. They are a response to a Hungarian prohibition against stone Orthodox churches. The churches are made of thick logs, are quite small and dark inside, and painted with rather 'naïve' Biblical scenes. The most characteristic features are the tall tower above the entrance and the massive roof that seems to dwarf the main body of the church. I visited 4 out of these 8 churches by car on a day trip from Baia Mare. The first one I headed for was in Rogoz. Memories of a trip searching for small wooden churches in Slovakia came to my mind – finding them in towns full of churches is not all that easy. Rogoz also has several churches. The “old wooden one” is at the back of the village, while the newer ones have prime locations. In fact, there are two old wooden churches next to each other here. The church was locked so I only had a look at its distinct exterior decorations sculptured out of the wood. I then drove on to Surdesti. The church here is on a hill at the end of a tiny road. Rain had started pouring again, but I had come at a right time: there was a service going on (it was Sunday morning). The singing could be heard from afar. Dozens of people had to stay and pray outside. I sheltered beneath the gate, together with a begging boy and some latecomers. After the service ended, surely about 200 people came past us. I then could enter the church. The interior amazed me: it was like a warm home! Woollen blankets covered the benches and the floors. The interior walls are completely covered in vague, naïve paintings. Afterwards I went back to Baia Mare waiting for the rain to end. I took along the young beggar from Surdesti church, who was hitchhiking by the side of the road. He wanted to get out at the next church in town, after having verified that the service was still going on. So he could get something from 2 congregations in one morning! Later that afternoon I went to visit two churches to the northeast of Baia Mare, Desesti and Budesti. It takes crossing a mountain pass with about 20km full of hairpin bends to get to this secluded region. The church in Desesti is uphill, entered via a large graveyard. Sculptured decoration covers the outside walls, mainly geometrical motifs. Chicken are the prime residents on site so it seemed. The road from Desesti to Budesti is the prettiest that I have taken in Maramures. It's small and winding, and passes through farmlands with the characteristic Romanian pear-shaped haystacks. The church in Budesti is quite hidden in town also, the signboard had fallen down and I had to ask one of the old ladies in the street who were watching me anyway. A couple of men were digging a grave in the front yard of the church. The church here has bigger windows (a late addition? ), so I could peek insided to see the paintings here. Visiting these churches I think is as worthwhile for a look at rural life as it is for "just" the wooden architecture. Barsana - accessed by bus from Sighet, the ancient church is located on a hilltop at the western end of the village. This should not be confused with the much visited Barsana Monastery at the eastern end, 6km away. The monastery is a huge 21st century complex constructed in the vernacular style, demonstrating that ancient construction techniques are still alive and well. Desesti - accessed by buses running between Sighet and Baia Mare and descibed above by Els. Sudesti - I accessed three other churches by taxi from Baia Mare. This church had an amazingly tall steeple. The interior wall and ceiling decoration was very flakey. Plopis - only a short distance from Sudesti, this church also has a tall steeple. Rogoz - The friendly priest drove 14kms from Targu Lapus to open the church especially for me! He showed me all the symbolic carvings decorating the exterior of the church, and explained their significance. The interior decoration was in surprisingly good condition. Great wooden churches built in 17th and 18th centuries in Northern Romanian region of Maramures, close to Ukraine and Hungary borders. These churches are always in small villages. In order to get them you should head for the towns of Baia Mare or Sighetul Marmatiei. Churches of Surdesti and Plopis are not far from Baia Mare but I recommend you to rent a car as public transport is not very reliable there. Same with churches of Desesti and Budesti that can be reached from Sighetul Marmatiei. Churches are not always open but sometimes the key can be found somewhere in the villages. You should get till there and ask about it.